From 1950 to 1953 Sihlali studied art at the Moroko Chiawelo Centre. He then frequented the Polly Street Art Centre from 1953 to 1958, studying under Cecil Skotnes. He has taught at various art centers in Soweto and, from 1983 to 1988, headed the fine arts department at the Federated Union of Black Artists (FUBA). He has also participated in the Thupelo workshops. 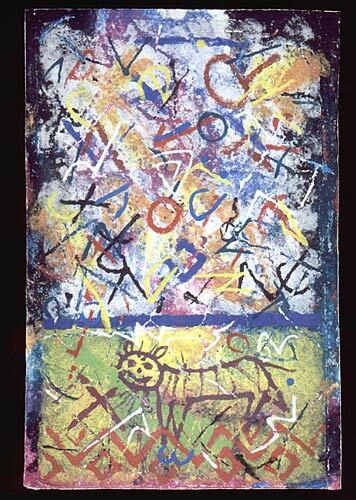 To create the colorful motifs in this work, the artist applied dyed paper pulp with a brush or tool, then pressed the pulp with a roller onto the surface of handmade paper. The marks, circles and Xs layering Graffiti Signaturesecho graffiti scripts found on urban walls in South Africa. For Sihlali, such walls act as a form of urban literature, chronicling important local histories.